What a beautiful way to decorate a table for Easter Supper! Sometimes the simplest ideas can be the most stunning! 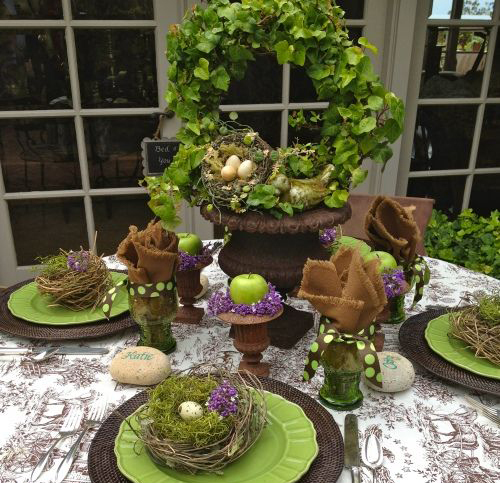 Here is an easy way to decorate your table for Easter using a few simple garden pots! The centerpiece and focal point of the table is a large garden urn. Buy an ivy plant at your local garden center or nursery or better yet go to a craft store and get a piece of silk ivy. Fill the bottom of the urn or garden pot with floral foam. Take a wire coat hanger and bend it into a circle sticking the ends into the foam. Place the ivy in the base of the pot and wrap it around the coat hanger. Next take a reed birds nest and place it on the top of the pot of course filled with a few candy eggs. Shown with a decorative bird on the top but you can use anything you want. Next take small urns and fill with shredded paper and top with a green apple. The apples will pick up the color of the plates. The hand painted stone name place cards, ribbons on glasses and brown burlap napkins are all the icing on the cake. This project is not that difficult or expensive. Just break the photo down into the pieces you want to copy and create your own outstanding Easter Centerpiece using Garden Urns or Pottery. Read more.....Dining in a pottery kind of style!